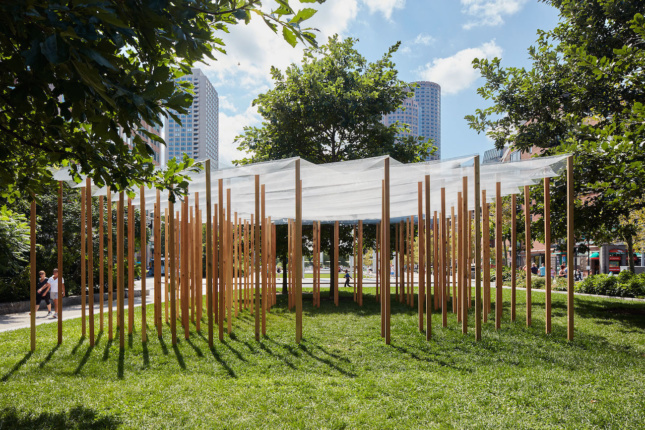 Winners of the fifth Design Biennial Boston can be viewed on The Rose Fitzgerald Kennedy Greenway Conservancy in Boston. Aimed to celebrate and give exposure to up-and-coming architects and designers from the New England region, the Biennial is on view until October 18th. This year, it consists of four installations which vary in themes, materials and artistic style. In order to bring their ideas to life, Design Biennial Boston has provided each winning team with $10,000 and access to cutting-edge fabrication equipment provided by sponsor Autodesk BUILD Space. 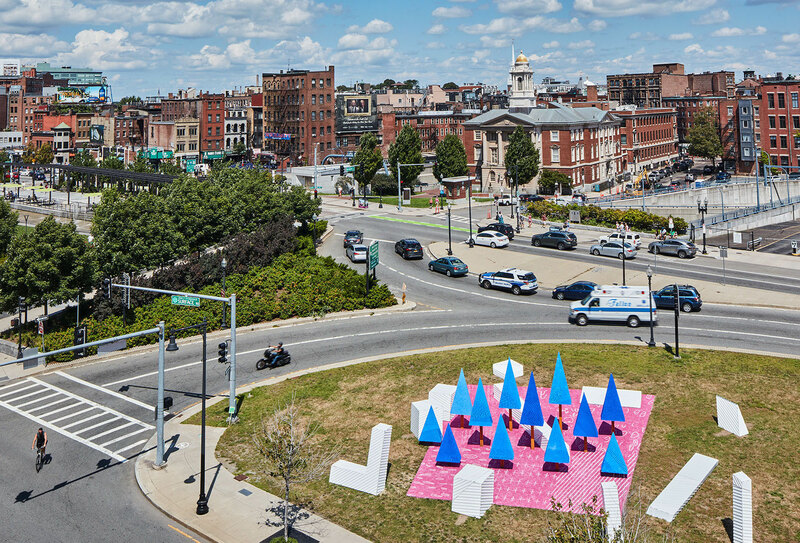 The four winning teams, selected among a pool of designers from New England, were called upon to create installations echoing the region’s unique qualities and reflecting on the Greenway’s Playful Perspectives theme. The works by Jennifer Bonner of MALL, Rania Ghosn and El Hadi Jazairy of DESIGN EARTH, Daniel Ibañez of Margen-Lab, and Yasmin Vobis and Aaron Forrest of ULTRAMODERNE entertain ideas of rigid to free-flowing forms, local materials, economic trends, and global impacts all representative of the region. Another Axon by Jennifer Bonner of MALL (pictured above) is an installation comprised of a colorful array of twelve minimalist trees. A play on traditional architecture and design rendering, the installation uses common building materials such as vinyl siding, stucco, and artificial turf to challenge perceived building ideas. Primitive by Yasmin Vobis and Aaron Forrest of ULTRAMODERNE is a geometric disposition of lines juxtaposed with rough materials: rugged cedar columns canopied with a thin aluminum shroud. The relationship between the shapes create an experience of existence within an abstracted, delicate grove. 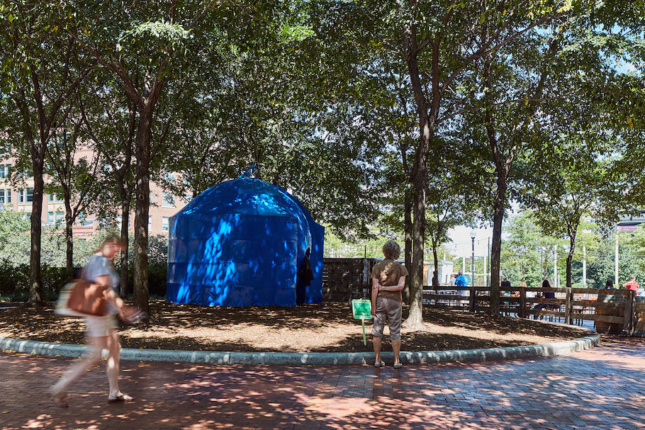 Blue Marble Circus by Rania Ghosn and El Hadi Jazairy of DESIGN EARTH is a spherical, plastic monument highlighting the correlation between humanity’s actions and the degradation of the ecosystem. The installation, as the name suggests, is a deep-blue plastic sphere which through form, color and material refers to the iconic symbol of environmental awareness. Ways of Wood by Daniel Ibañez of MARGEN-LAB is a compilation of logs that serve as public seating. The logs draw a visual connection between different states in timber’s industrial process, from raw material to its highly polished state as a designed object. 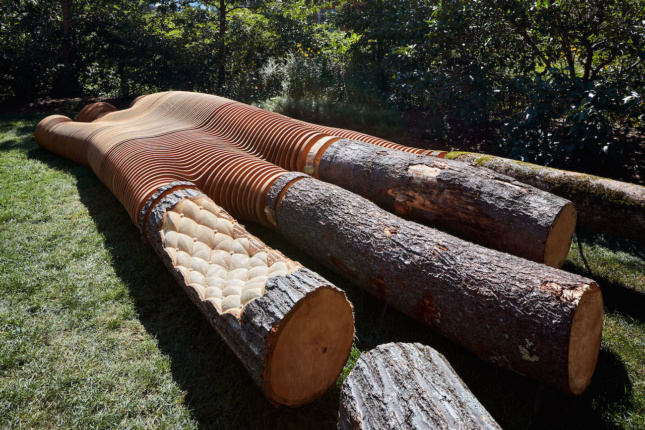 The installation aims to initiate a conversation on North America’s timber extraction industry and serve as a reminder of the often forgotten natural source of timber.